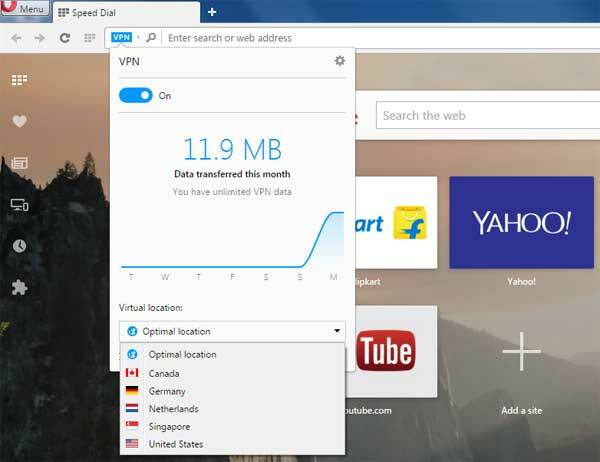 Opera has incorporated a free VPN into version 40 of its popular web browser. You can connect to one of its five VPN servers around the world and the connection is really fast and unlimited. Once enabled, you can hide your true location and access content that would otherwise be unavailable. Currently Opera browser offers 5 virtual locations, such as US, Canada, Germany, Singapore and Netherlands. By default, it will connect to ‘optimal location’. You can change it to a desired location by clicking the virtual location tab. 1. Install latest version of Opera browser (version 40 or up) by downloading it from here. 2. To activate the VPN, go into the browser’s Settings and, in the ‘Privacy & security’ section, tick the Enable VPN box. 3. A blue VPN badge will then appear in the address bar. It means you have connected to a VPN server. 4. Click on blue VPN badge to change your location preferences 5. You can also see how much data you have used over the past month by clicking on the VPN badge. Sometimes, Opera will not connect to any VPN severer. This might be due to various reasons. If this happened, go to Opera Settings > Privacy & Security > and click on ‘Clear browsing data’. Select all the options and then clear the browsing data.